Endodontic therapy, more commonly known as root canal treatment, is performed on an unhealthy, infected nerve of a tooth. 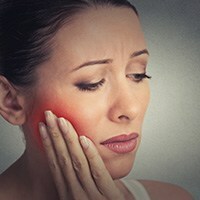 When decay or facial trauma results in an infection around the root of your tooth, endodontic therapy treats the problem before bacteria can cause further damage. If left untreated, the infection can spread and result in immense pain, oftentimes necessitating extraction of the tooth. Fortunately, today’s modern technology makes it possible to perform root canal therapy in a way that is no less comfortable than the process of placing a filling. 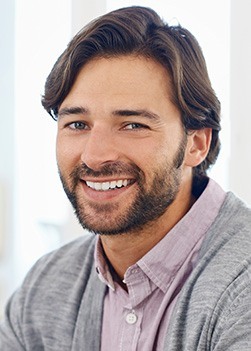 Why Choose Brooks Dental for Endodontics? During root canal treatment, the affected area is anesthetized for optimal patient comfort. Any diseased tissue within the canal(s) of the tooth is removed and cleared of any sign of infection. 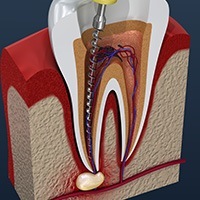 The resultant cavity is then filled with a biocompatible material and sealed to prevent future damage. A custom crown is then placed over the tooth to restore full form and function. It is important to remember that not all root infections present with noticeable symptoms. This is why routine checkups with the team at Brooks Dental are so vital to continued oral health. If you think you may be suffering from a root canal infection, please do not hesitate to contact our dental office to schedule a visit with our team.